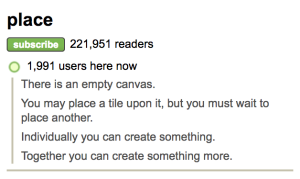 I was already thinking about self-organizing systems and emergence when I discovered the amazing Reddit Place collaborative art experiment that recently played out on the internet starting on April 1st. 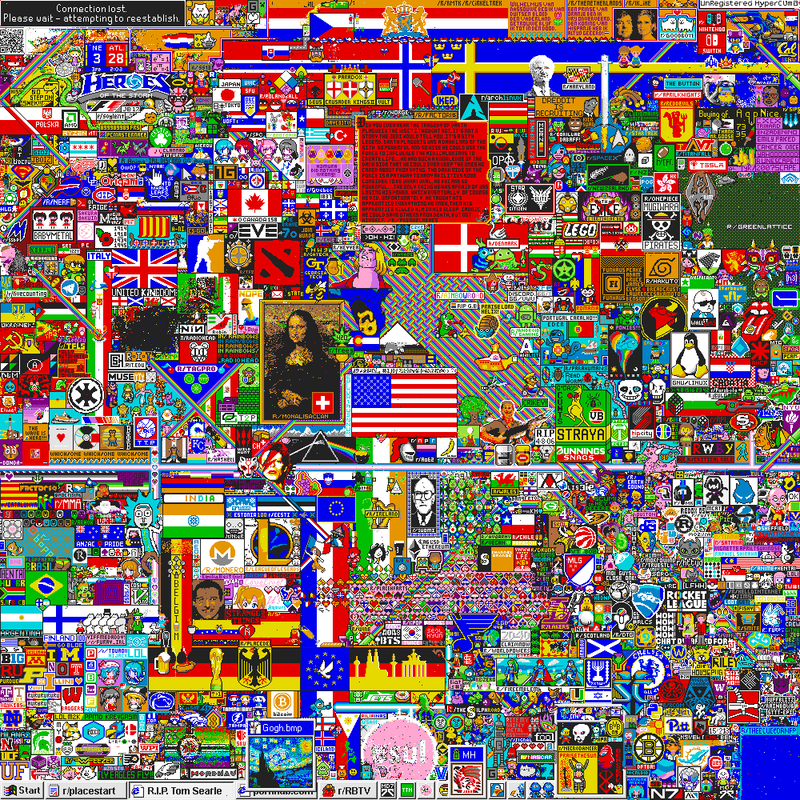 Contributors were invited to place one pixel on a 1000 x 1000 pixel blank canvas, and permitted to add additional pixels only after waiting for several minutes. 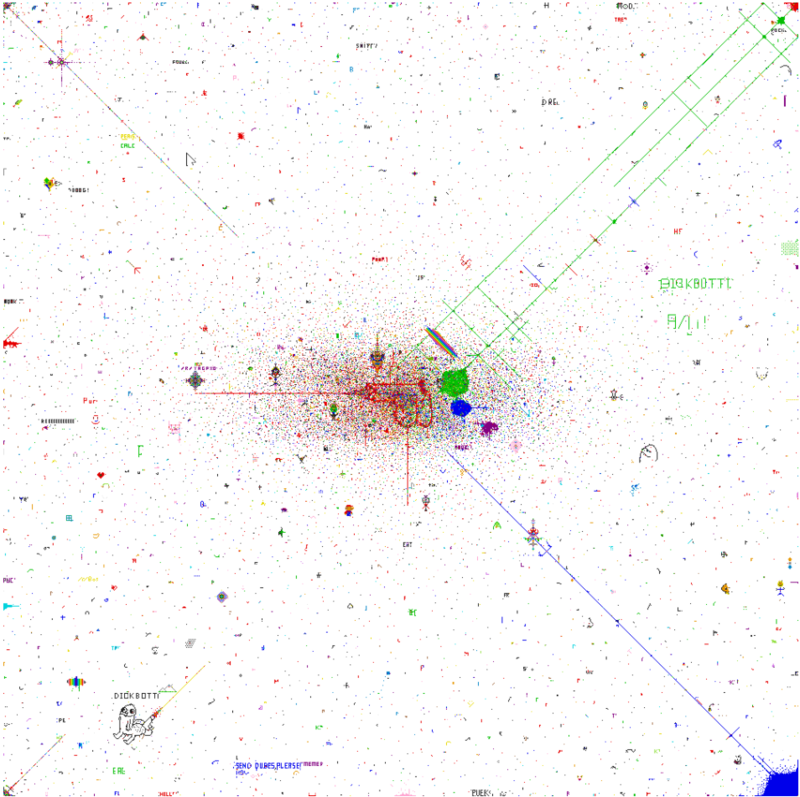 No one person could control the evolution of these images. If you aren’t already familiar with the project, this article by @sudoscript offers an efficient rundown of what happened. I want to focus in on two aspects of this event. First, let’s talk about the #dickbutt cartoon that emerged as one of the first coordinated efforts to create a graphic, quickly followed by a Pokemon character that immediately began to grow a male appendage of its own. This is pure Reddit culture, at once irreverently creative and aggressively male. Groups form by defining insider and outsider status. While the Place project was exactly the kind of collaborative building effort that can bring people together, it was informative to see that the initial choice of subject matter sent a clear message about the identity of the creators and who should feel unsafe in this space. If one sees the entire 72-hour project as a microcosm for the emergence of civilization, then #dickbutt speaks to the core role of the construction of gender in that process. I’m less concerned with the ancient, historical accuracy of this narrative than with the ways that we repeat this mechanism every day, recreating this same organizational structure in each new space we occupy. From this perspective, each new event is yet another opportunity to renegotiate the balance of power and to re-examine the relationship between vitality and aggression. This using of misogyny and homophobia as grounds for tech bonding should not (did not) pass uncontested. That noted, there was a remarkable (surprising) absence of racist imagery in Place as it evolved over those three days. Even #dickbutt morphed into a somewhat more sophisticated identity as #dickbutterfly before it was eventually devoured by the evolutionary process. The predominance of flags, which began to emerge within the first hour and feature strongly in the final image, speaks to the core role of nationhood in our identity as we currently construct it; the battle between Germany and France a powerful (nonviolent) echo of the world wars; America still manages a triumphalist late entrance. My second observation is that looking back on the entire second half of the project offers a powerful metaphor for the finite space we share together on this planet. By the midpoint of the project, every new pixel was replacing one already laid, every inch compacted to accommodate others. A key difference between the virtual world of Place and our own real world is that our actual planet so densely packed with human activity would not support life. In our real-world drama, some factions must (do) speak out for the other species and the environment we share, which does not have a voice in this transmedia debate, but whose survival is ultimately, intimately tied to our own survival. One glimpses in Place an immediately obvious fact: that we are heading eventually towards a similar crisis of space and that the global conversation can transform and be be redefined with remarkable efficiency in the context of new threats and new ideas. What is most heartening is that, far from sinking to the lowest level, the final image bursts with life and diversity. Might we find the same ingenuity in the negotiations that matter.